Most people would like a space all their own. Whether that space is a small area of the home (think reading nook), or if it consists of an entire level of the home (think man cave), a space specifically designed for one person rather than the family can be a refreshing place to focus on quiet and solitude. Below we will discuss how to make this a reality for the man in your life. Use darker colors. That can mean a dark blue, green, grey, brown, or it can be a dark colored wood stain. Start decorating by choosing the overall color scheme. Try choosing a dark neutral and a main color (perhaps his favorite?) along with one or two lighter accent colors. This helps to keep the space from feeling monotone and heavy. Beginning with the floor, choose rich materials for the space. 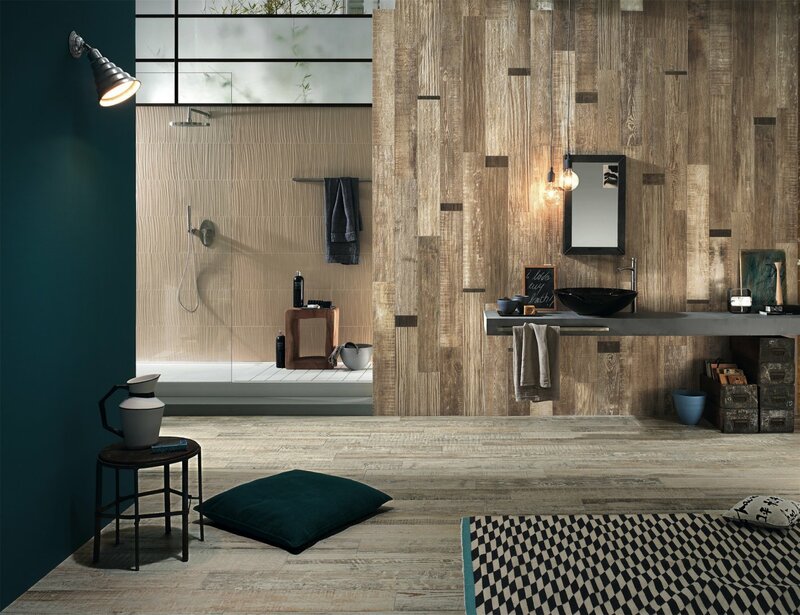 Try Florim USA’s Plantation in Dark Walnut, Italgraniti Scrapwood in Coke or Florida Tile’s Magnolia in Cherry. These have the appearance of wood while giving all the benefits of porcelain tile (that means no tears over spills!). Many wood-look tile choices can also be used on walls for a wood paneled wall. Select large and oversized seating. Oversized furnishings add to the masculine theme you will have going on. Choose rich materials for this as well, such as leather or metal. Overstuffed chairs can work well in the space, but make sure the colors fit with your theme. Choose masculine accessories. Think of hunting cabin accessories or art in a dark palette. Perhaps antlers are the way to go. A fur rug or throw may help the theme. Car-themed artwork can add a fun twist for fans. This is a great place to display hobbies or collections that don’t fit anywhere else in the home! Having a small wet bar is a nice touch if the space is available. You can decorate it with decanters and glasses. In smaller spaces, a beverage cart is a good alternative. This is a wonderful way to bring a small portion of the kitchen with you and serve anything from icy drinks to warm comforting beverages. This can be a fun way to celebrate individuals in the family and give a special member of your home a place of his own. Just remember think dark, bold and oversized!